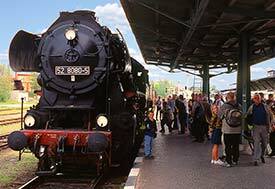 ABOVE: An excursion train at a station in East Saxony. INSET BELOW: A high-speed diesel train at the Saxon Railroad Museum, and a conductor on the Fichtelbergbahn steam railway. Saxony, the easternmost Land or state in Germany, has a railroading tradition that dates back to 1839, when Germany's first long-distance railroad began service betweeen Dresden and Leipzig. But don't rush off to those Web sites just yet: In the articles listed below, you'll find pictures and descriptions of train museums, a steam railroad, an aerial cablecar, a model railway, and a train hotel-restaurant that I personally visited during a recent trip to Saxony.